Many thanks for attending the recall AGM on 12 March, especially in such awful weather. The branch can now step forward and deal with the host of issues facing us in the coming year. The whole point of a union is that, whereas individuals can make little difference of their own, they are a force to be reckoned with when they join together. That came over loud and clear at the AGM. There were great and at times emotional contributions from a range of members on serious issues and more reports will follow in the next few days. In the meantime thanks again to stewards for putting their work in and members for turning out to ensure our branch can keep going forward. The Annual General Meeting on 26 February was short of the 200 members needed to have a legal branch AGM. Thanks and apologies to the 160 members who did attend. Please make every effort to attend the meeting on 12 March. 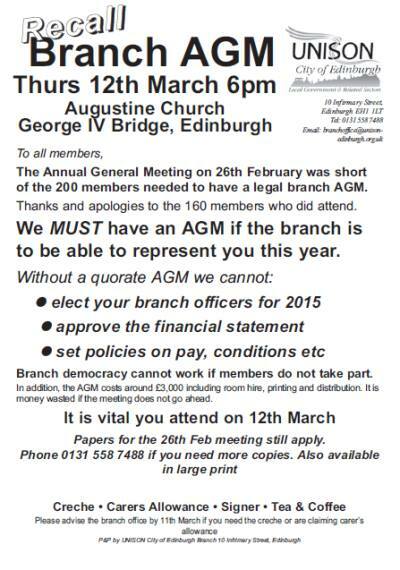 The AGM is the branch’s supreme policy making forum. It will elect the Branch Officers for 2015, set policy on important issues affecting all members and can amend rules. The notice is being issued now to allow members time to consider and submit nominations and motions and to meet deadlines for the agenda and annual report to be printed and circulated at least seven days before the meeting. Stewards Committees or Branch Committee. The names of the two members, their membership numbers and signatures (or signatures of Convener and Secretary if from a Shop Stewards Committee). To ensure time is not wasted, motions must be deemed competent and relevant by the Chair before going on the agenda. The same conditions apply with the addition that the candidate’s name, workplace and membership number must be included. Nominations, motions or rule changes MUST arrive at the branch office by the deadline on this calling notice (see above). This is a very important meeting. Please make every effort to participate. If anyone needs assistance or advice about submitting issues to the meeting, please feel free to contact the Branch Office.